Depending where you are at the moment, there’s probably some sort of weather outside. If I had to guess, if you’re in the northern hemisphere (note: spheres aren’t flat) of our humble Earth, it’s going to be rather chilly. If you’re in the southern hemisphere, on the other hand, you might be pleasantly warm. We’ve had some extreme weather in the past few months, from blazing heatwaves causing wildfires in California, temperatures hot enough to cook a steak in a car in Australia, and a few weeks in the UK in which some people wore nothing but shorts and a t-shirt, imagine! Now, however, parts of the world are experiencing the opposite of that, and some of the lowest temperatures ever are being recorded by meteorologists, particularly in America, where some states are currently colder than Antarctica. North Dakota, for example, is currently feeling the chill at -32°C (-25°F), while added wind chill is making Minnesota feel like -52°C (-62°F). 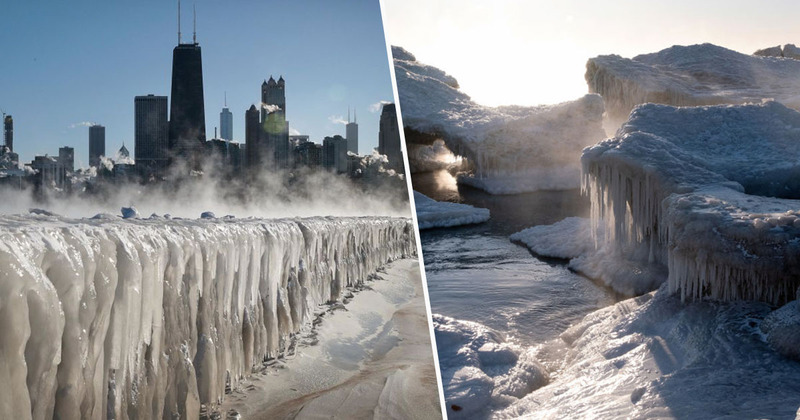 In Chicago, the daily average temperature is currently around -17°C (1.4°F), though nighttime temperatures have been hitting -25°C (-13°F), making it the second coldest day in the windy city over the past 150 years. Residents have reportedly been told ‘not to breathe deeply’ if outside in the ‘deadly polar vortex’, according to the Independent. As with most types of extreme weather, the pictures that are captured during it can be spectacular. Especially if Lake Michigan, one of America’a Great Lakes, freezes over. Chicago O’Hare International Airport has cancelled more than 1,500 flights over the past couple of days due to the weather. While those searching for an alternative way to travel might not have much luck with trains either, as railway workers have had to set the tracks on fire to counteract the cold and prevent them from cracking, as BBC News reports.. Meanwhile, back on the lake, some photos look like the water is boiling due to fog rising. This is because the water temperature is higher than the air temperature. It may look amazing, but these temperatures are dangerous, and even life-threatening. With a wind chill of 50 degrees below zero, only five minutes of exposure can lead to tissue damage that is normal in a healthy person. So, if you have to go outside, wrap up warm. Or, even better, stay indoors. Authorities are also providing ‘warming centres’ throughout Chicago. If you or someone you know needs assistance, residents can call 311, no one in need of shelter or help will be turned away.